LOS ANGELES (VIP NEWS) — William Morris Endeavor (WME) Entertainment has signed Tegan and Sara to a worldwide agreement, according to The Hollywood Reporter. In February the indie duo took the Oscars stage to perform The Lego Movie’s nominated song “Everything Is Awesome.” That celebratory appearance came a year after Tegan and Sara swept their native Canada’s Juno Awards, winning group of the year as well as accolades for pop album Heartthrob and its lead single “Closer,” which became their first song to chart on the Billboard Hot 100. The track also peaked at No. 1 on Billboard’s dance club chart and was eventually certified gold in the United States. In 2014 Tegan and Sara also were named GLAAD’s Outstanding Music Artist for their artistic accomplishments as well as for their ongoing contributions to the LGBTQ community. And in 2013 they received their first Grammy nomination, for the long-form music documentary/live concert album Get Along. Over 15 years, Tegan and Sara have sold more than one million combined copies of their seven studio albums. The identical twins are currently working with producer Greg Kurstin (Sia, Katy Perry, Pink, Beck) on their eighth album, which will be released on Warner Bros. Records next year. 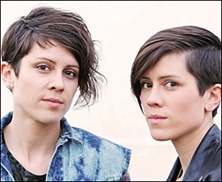 Tegan and Sara were previously represented in the U.S. by The Agency Group, which was acquired by UTA last week.